My post this week is how Social Media helped me make the best of an extremely awkward banking situation. My post on Media of Birmingham, "ADVANCE CRISIS: The insanely obsessive guide to the Birmingham News/al.com implosion," is a comprehensive look at changes in our media market. It's close to 2,500 words, it's packed with photos, videos, GIFs and trivia, and slices and dices our media landscape. 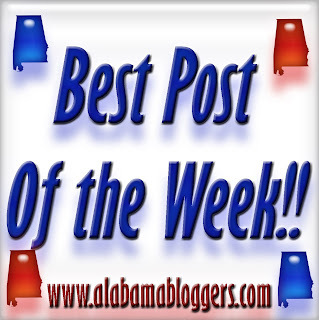 Another post, on the Alabama Social Media Association site, recaps our last event and looks ahead to the next one. Our link goes to our Press Room blog where we wanted to share with the public how our Social Media Department went into action after the OKC storm and Hoteliers responded to our request. The more I learn, the more I understand that it all - my writing, my success, my life and everything in between - comes back to the foundation of relationships. I have to invest in engaging relationships to get to that place that I desire. I was feeling a bit crafty . . .
A third post: On Project Bulk, how a little flexibility has kept me on track for 266 days. Memorial Day grilling tips!! Hope everyone has a fun and safe weekend!! Friday's Montgomery Symphony Orchestra pops concert. Did anyone go? My link is on the fine art of losing an hour or more online to who knows what!